Yes we can! 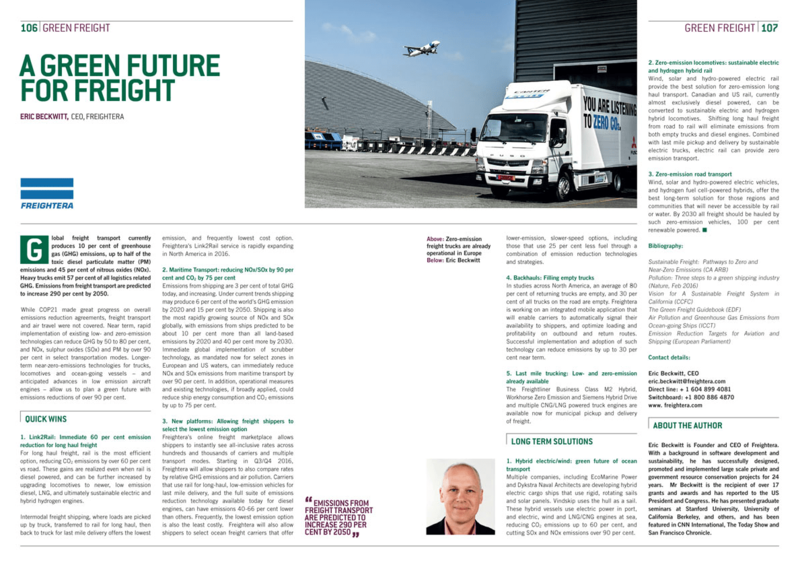 Technology allowing us to decrease emissions from freight transport significantly is here now and that’s what our article on “A Green Future for Freight” is about. It was just published in the 2016 G7 Summit issue of Climate Change: The New Economy and distributed to the G7, leading UN agencies, NGOs, senior policymakers, chief scientists and CEOs of the Fortune 500. Featured with visionary statements from Canadian Prime Minister Justin Trudeau, American President Barack Obama, IMF Managing Director Christine LaGarde, and other government and industry leaders, Freightera CEO Eric Beckwitt summarized the immediate quick wins that can reduce greenhouse gas emissions and air pollution from freight shipping over 60%, and the longer-term technologies and policies that can provide zero and near zero emission freight transport globally. “We want to reach out, hear from and collaborate with forward thinking members of the freight transportation community worldwide, both shippers and carriers, that can work with us to reduce emissions and air pollution immediately,” Beckwitt says.